Google's copyright rules state that: "Google does not need to provide you explicit permission to move forward with your project and no contact with Google is necessary so long as you follow the requirements mentioned (below)". Instead they provide a software tool that asks several questions and at the end it is clear whether or not one's use of their material is permitted. With Street View images their biggest concern is that the images not be cached (or captured as in a screen capture). Google is constantly updating their Street View images based on requests. For example if they forgot to blur a face and someone complains they will go back and fix the problem. If the original image had been captured statically and stored then it would still show the non-blurred image. 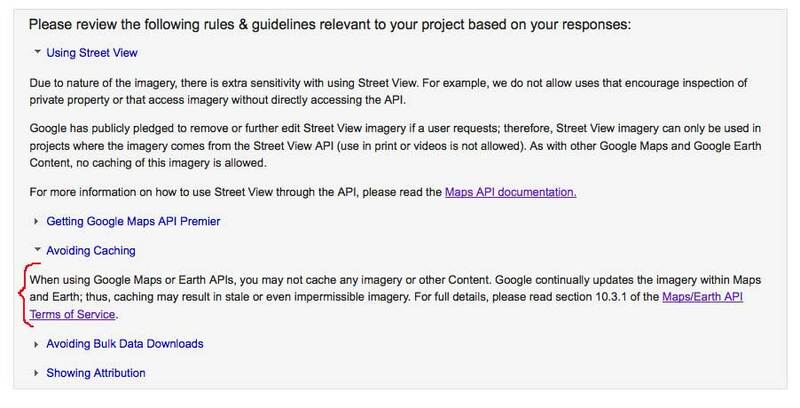 So Google wants all references to Street View images to be dynamic so that when they change an image then the image in the project will change too. To meet these requirements all my Street View images are dynamic links to Google's web site that will update when they change their images.